Modern example of eyelet embroidery. An eyelet (or eyelet hole) is a hole that is pierced in the ground material with a stiletto or cut into the ground cloth. On the reverse of the fabric often a metal ring is attached that strengthens the edges of the hole. The hole is then normally outlined with running stitch and neatened with either an overcast stitch or buttonhole stitch. The use of this type of eyelet can be found on embroideries, often called eyelet embroideries, eyelet work or eyelet hole work, from many parts throughout the world. Eyelet work is the name sometimes used for broderie anglaise. 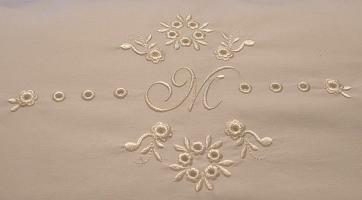 Be aware that the eyelet hole is also the name for a different stitch, used for instance in Hardanger embroidery. EATON, Jan (1986). The Complete Stitch Encyclopedia. Twickenham: Hamlyn, pp. 117, 119. THOMAS, Mary (1934). Mary Thomas's Dictionary of Embroidery Stitches, London: Hodder and Stoughton, p. 85. Digital source of illustration (retrieved 8 July 2016).